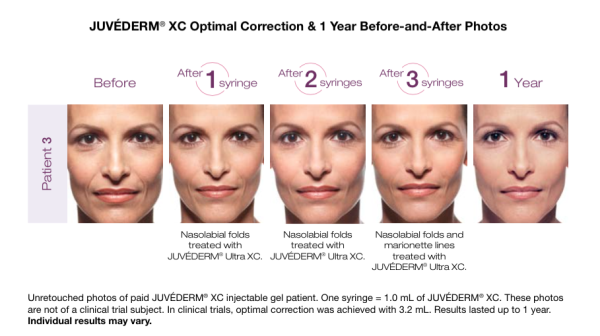 JUVÉDERM® XC injectable gel is a smooth consistency gel dermal filler that helps to instantly restore your skin’s volume and smooth away facial wrinkles and folds like you “smile lines” or “parentheses” (nasolabial folds), the creases that run from the bottom of your nose to the corners of your mouth. JUVÉDERM® XC comes in two formulations, JUVÉDERM® Ultra XC and JUVÉDERM® Ultra Plus XC. JUVÉDERM is the only HA filler FDA approved* to last up to one year. 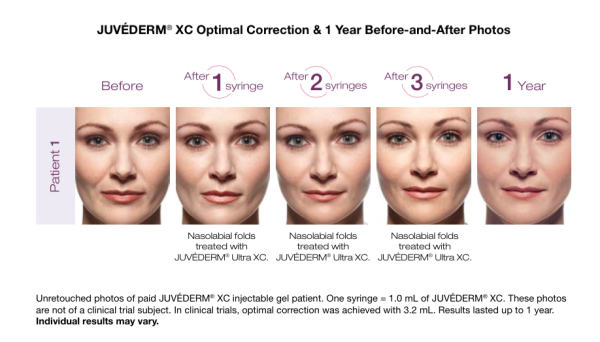 JUVÉDERM® Ultra XC and JUVÉDERM Ultra Plus XC injectable gels are indicated for injection into the mid to deep dermis (below the outer layer of the skin) for the correction of moderate to severe facial wrinkles and folds, such as nasolabial folds (the creases running from the bottom of your nose to the corners of your mouth, aka smile lines or parentheses). Why does JUVÉDERM® XC come in two formulations? JUVÉDERM® XC injectable gel is available in two formulations to allow your healthcare professional to tailor treatment to your unique needs. JUVÉDERM®Ultra XC provides versatility in contouring and volumizing facial wrinkles and folds. JUVÉDERM®Ultra Plus XC is a more robust formulation for volumizing and correcting deeper folds and wrinkles. 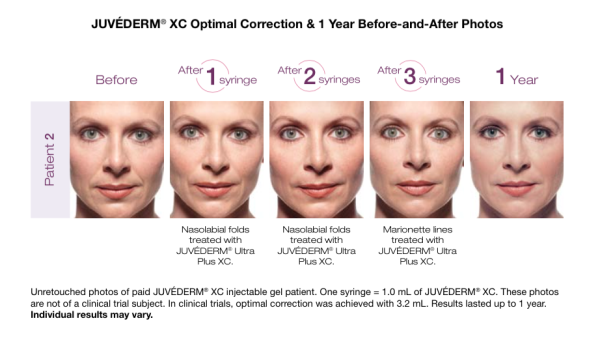 JUVÉDERM® XC is the only hyaluronic acid (HA) filler FDA approved to last up to 1 year after initial treatment. The manufacturing process provides a high concentration of cross linked hyaluronic acid for long lasting results. It also works to create a smooth consistency gel that flows easily into the skin and provides a smooth, natural look and feel. Other hyaluronic acid dermal fillers currently on the market are made of granular consistency gels. JUVÉDERM® is the first hyaluronic acid dermal filler that has demonstrated its safety and effectiveness in persons of color. “Uncross-linked” hyaluronic acid in its natural form is in a liquid state. “Cross-linking” is the process through which hyaluronic acid is made into a gel product that can be injected into the skin for long lasting results. Injections may cause some discomfort during and after the injection. The smooth consistency gel of JUVÉDERM® XC allows your doctor to administer it easily and smoothly. It is injected directly into the skin using a fine needle to reduce injection discomfort. 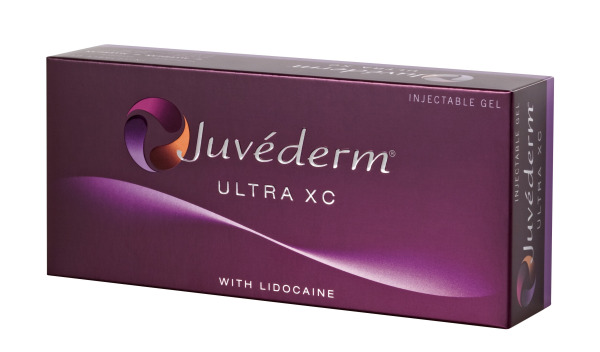 Additionally, JUVÉDERM® XC is formulated with lidocaine for a more comfortable treatment experience. No. Correction is temporary; therefore, enhancement injections as well as repeat injections are usually needed to maintain optimal corrections. Most side effects are mild or moderate in nature, and their duration is short lasting (7 days or less). The most common side effects include, but are not limited to, temporary injections site reactions such as redness, pain/tenderness, firmness, swelling, lumps/bumps, bruising, itching, and discoloration. As with all skin injection procedures, there is a risk of infection. Information from www.Juvederm.com . Consult this website for further information.